This latest edition comes in two parts, so....bear with me! Man, it's been quite the culinary odyssey for me lately. Not only has the Weekly kept me busy but also trying to get this blog here updated. That and having a full time day job and a wife and cat, boy...it's kind of a wonder I get anything done at all. 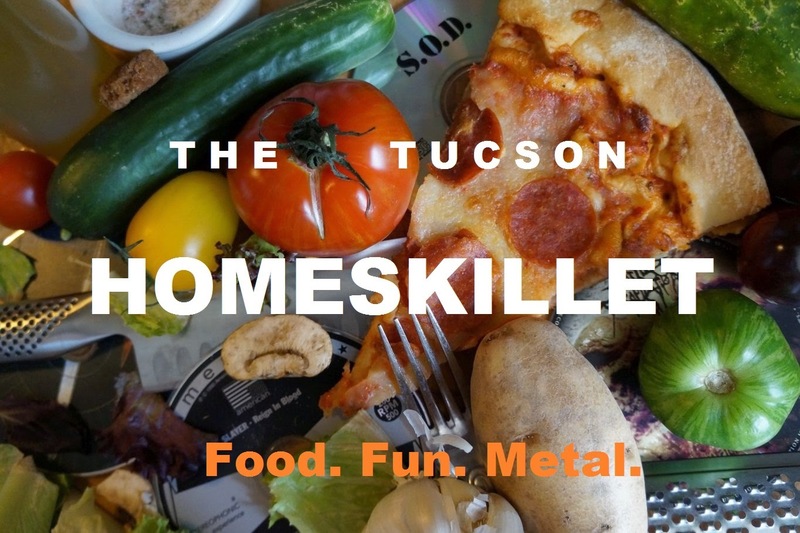 Thing is autumn is here and that means the snowbirds are slowly coming back, students have arrived, the weather is (sort of) cooling down and the Tucson food scene is heating up. Lots of events, lots of fun stuff and lots and lots of delicious food to be eaten. 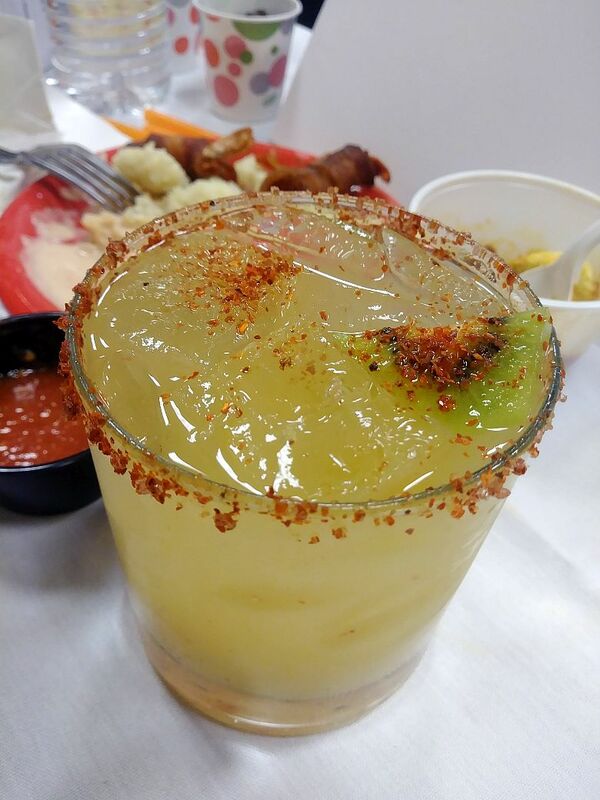 Outside of the normal specials and seasonal dishes happening at local restaurants, there are several goings-on to keep our rich culinary culture alive letting the rest of the world we are the little desert city that could, does and always will be. 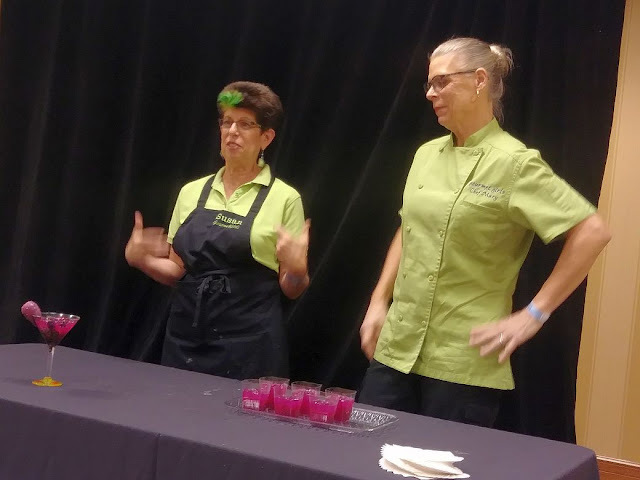 The two that I am featuring here are a recent block party out on by the GUT collective (Gastronomic Union of Tucson) and a margarita throwdown at the El Conquistador resort where I got chosen to be one of the judges! Neat right? See...they keep on trying to make me feel cool. C'mon now. Anyway, let's get to it shall we? On Sunday October 1st, from 3pm - 6pm, at the corner of Broadway and 5th, the GUT cooperative came together to throw an epic block party. 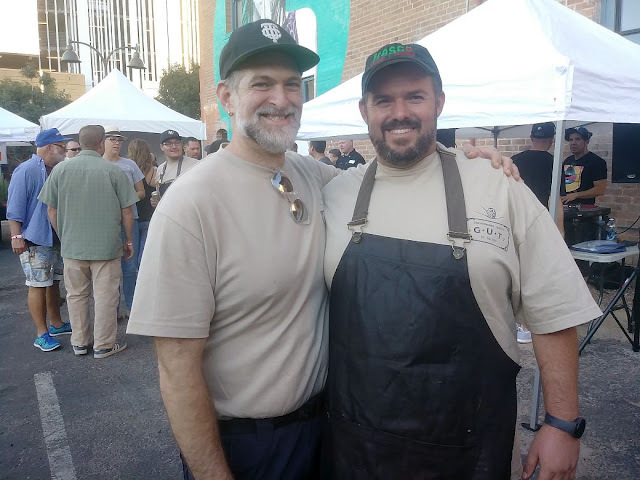 20 chefs from all over Tucson gathered to slow roast four whole hogs and do what they do best: Feed us, impress us and make us all proud to be a part of this amazing city. It was really warm that Sunday and the little plot of land was packed with patrons and those running the event. Each corner was set up with a pig roast station and beer vendors sat by their side. I first grabbed a cold IPA from Barrio Brewing, chatted with some friends I ran into then began to make the rounds to sample the goods. My first stop was to Michael Elefante of Mama Louisa's. 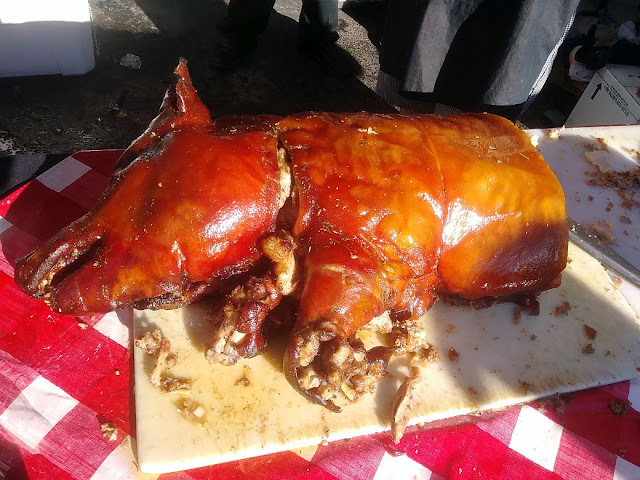 His hog was done porchetta style, meaning it was stuffed with all sorts of porky goodness - sort of like southern dressing in a turkey but gone full Italian. It was glorious. Crispy skin, the meat was succulent and the stuffing was delicious and savory. He paired it with some tender baby potatoes and a garlicky broccoli rabe. All of it collected together extremely well. I then scooted over to where Mat Cable from Fresco Pizza (who is also one of the head GUTters) was set up. Mat slow smoked his pig overnight which harnessed a very distinct, very campfire-y flavor to the beast. It sort of reminded me of a luau where they bury the pig under ground and just let it do its thing for a day. Loved it. More cold beer was to be had from new kids Crooked Tooth and Dillinger, who are straight killing it in the local brew scene. And one of my favorites, Pueblo Vida, was there serving what I think was a saison, which was lovely, and quite malty, and helped as the late summer sun was setting yet still a bit impending. 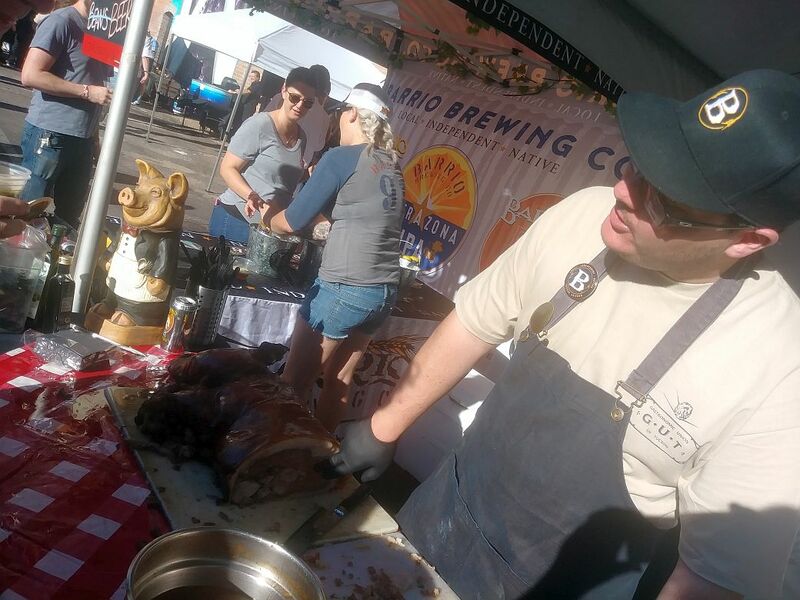 By 5pm the block party was in full swing and I still had two more pigs to try out. 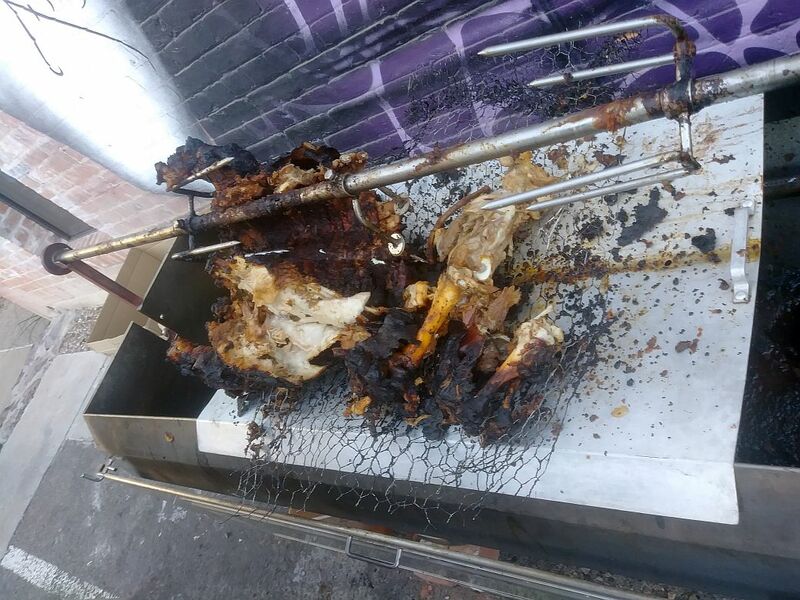 Obie from the Mountain Oyster Club cooked his in a special roasting box called a 'Caja China', which is pretty popular right now. Apparently it cuts cook time in half but...whatever. Obie's hog was awesome, really crispy and juicy. Maybe I should front the $500 and get myself one of those BBQ boxes. But then...where would I put it? The wife would kill me if I did. 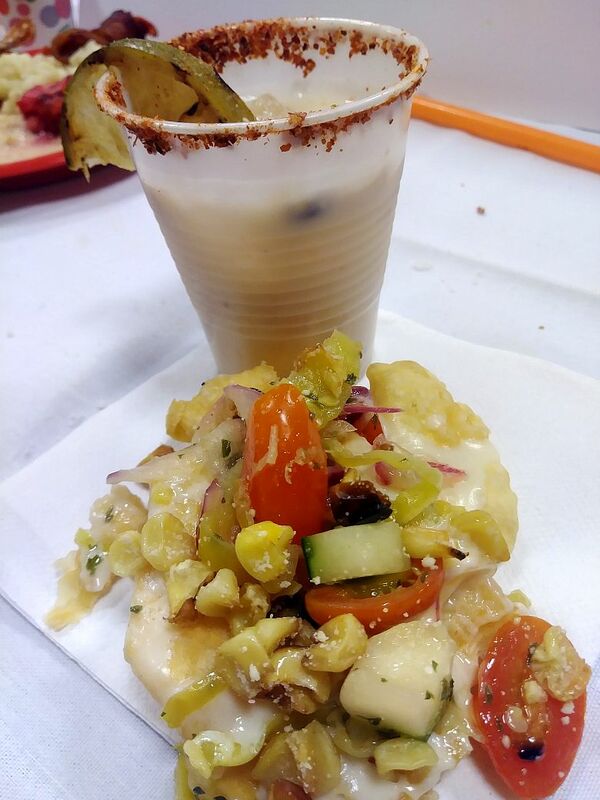 Last to try was from Gary Hickey, head chef at Charro Steak. 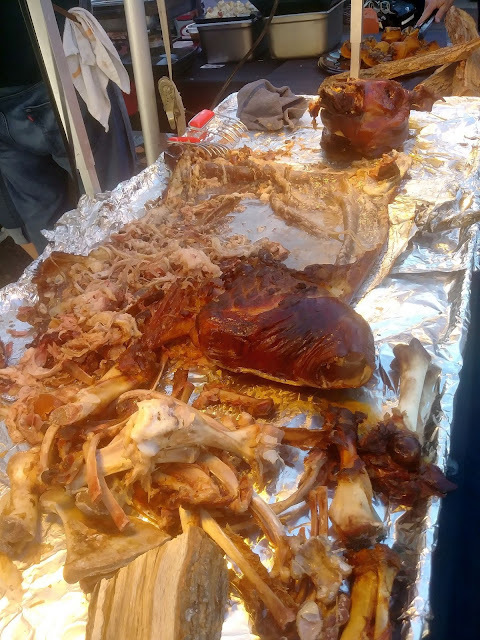 This man churned his pig on a spit over mesquite wood for several hours. To me, this was a distinct "Tucson" delivery of the product as it wafted of southwestern distinction and flavor. Good job man. 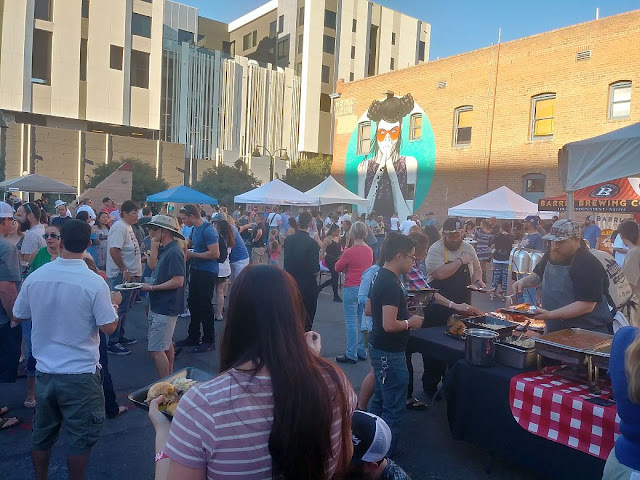 The best part for me was seeing so many new and old friends at the block party. The chefs, of course, but then there was Devon Sanner (another GUT master), Andi from the Daily Star, Jackie and Adam from Foodie, Rita Connolly, Bianca Ortiz, Mark Aubrey and, of course, the man that provided everyone with sausage, Tucson's own master butcher in residence Ben Forbes. So good and it was so good seeing you all. And thank you chefs for doing all of us proper. 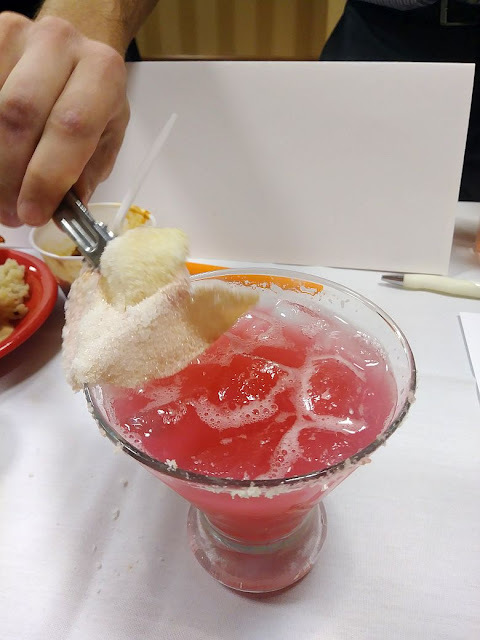 It's not so much because of this blog but more of because I am the food and beverage writer for the Tucson Weekly that I get invited to judge culinary competitions now. But when I walked into the judges room my name (which was misspelled) was over the title of this here blog so...I got a bit confused. Didn't matter. If they want me to rep my blog I will rep it so hard! 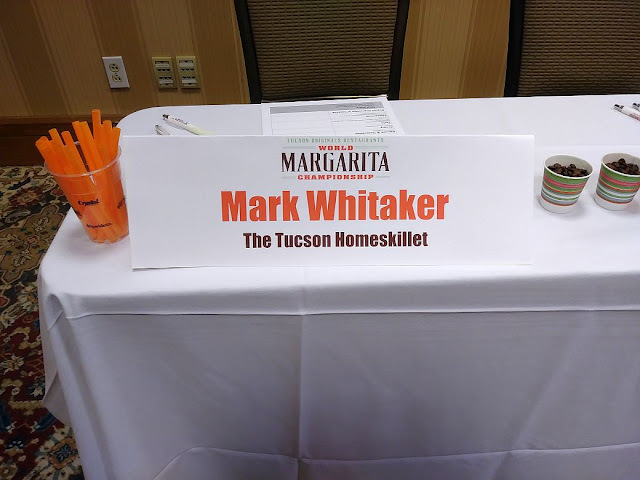 First off, it has become quite clear rather quickly that events such as the World Margarita Championship (which was held in Tucson and hosted bars and restaurants....from Tucson - so I guess they mean our 'little desert world', or something) are kind of haphazard. There is a lot of running around, confusion as to what or who goes where - which is probably how my last name went missing a T.
Competitors have 3 minutes to make the drink, serve, inform and take questions. 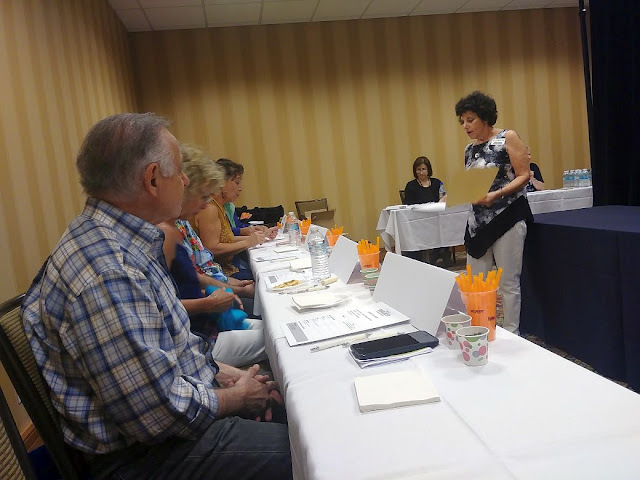 We then jot down on a pad our opinion of the drink, rating it from 1 - 10 on things like aroma, taste, garnish and presentation with an overall impression at the end. So we weren't part of the event at all, we were sequestered away from it; a secret panel of food folk about to get hammered. I have learned real quick to pace yourself when doing food or drink competitions. With this one we were to sample 20, 20!! !, margaritas from various restaurants and bars across southern Arizona. A lady to our left had a timer so when a competitor was at the presentation table she would say "Time starts now", then the margarita folk would do their thing and then the timer lady would say "One minute" which instills last minute panic for the margarita people and then timer lady would yell "Time!" and then margarita dudes and dudettes would have to stop. The judges also had a spit bucket if they needed. Blecch. Yeah, if you want pro drinkers with palettes and opinions you would think that they could handle a bit of hooch coming their way. We don't need no stinkin' spit bucket! Anyway, before long the first competitor walked in and the judging had officially started. Thing is, one of the other judges who I know, Andi Berlin, from the Star, wasn't there yet. So as some margarita man was doing his spiel I was texting her going "Where you be at?" and "Dude, it started." She would text back "On my way" or "Just parked" but the lady who, apparently, was in charge of things had already removed Andi's placard and said "Six judges is fine...I'm fine with this." She was kind of uppity. Finally Andi shows up, sits next to me and I tell her we're on our third margarita. Then weirdly tense in-charge lady comes up to Andi and was all "It's just not fair, I'm going to have to ask you to leave." So Andi just split. I would. There will be plenty of other events like this to judge so...whatever. I'd say about a dozen out of the 20 competitors paired their drink with a small entree, so we were getting fed as well. Drinking/sampling 20 margaritas on an empty stomach would be brutal. Kinda fun but...holy crap. By the 10th contestant my little area on the table was jammed with snack plates filled with all sorts of tasty nibbles. There was a decent amount of tacos alongside bacon wrapped shrimp, meats, cheeses, rice dishes and such. By margarita 15 I was pretty full, food wise, but still wasn't getting really buzzed. My strategy was to use the straws they put in front of us, dip it into the drink, plug up the end then extract it before dabbling a bit of drink on my tongue. This way I get to 'taste' the margarita but not really drink it. Even though lately, as I said in my last Homeskillet blog, I've been holding back a bit if not a lot from my usual drinking habits, I still have a mighty tolerance for booze. By the halftime mark I was feelin' it without really succumbing to the alcohol. If that makes sense. 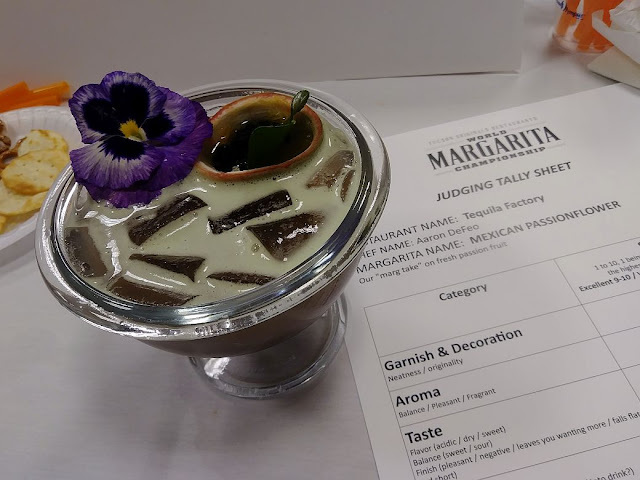 Although by drink 18 or 19 I realized the judging was coming to an end and I was totally clear headed so I started to sip a bit deeper getting me a bit more buzzed, which was fun. Hey. I had a ride home. No worries. 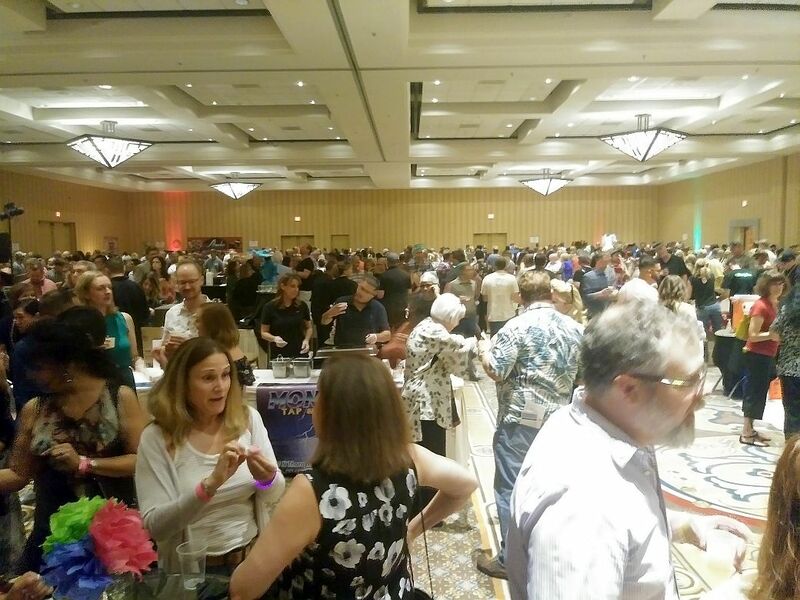 The event was held at the El Conquistador resort out in Oro Valley. Luckily my wife always worries about me when I do stuff like this so she drove me to and from. It's a bit of a trek from our place in mid-town Tucson but I got home safe so...thanks She-Ra! Once again, there were a lot of friends out there, some competing, some not, but one thing is for sure the ballroom where the public event was being held was wall to wall people. DJs were spinning dance music and drunk people were gyrating uncomfortably to the beat, food and booze was everywhere and everyone seemed to be having a good time. The judges got a 10 minute break around drink 12 so I had a chance to walk around and take it all in. Tickets were $55 in advance and $70 at the door. Yeah, sure, there was a lot of drinks and food to be had but...I wasn't convinced that it was worth the $70 door price. Although if you can afford to stay at the El Conquistador then I'm sure a paltry $70 isn't going to stop you from attending a food and booze festival. Some of my pals that were competing consisted of Mat Cable from Fresco, Rocco from Rocco's Chicago Pizzaria, Michael Elefante from Mama Louisa's and Chris from Pastiche. Other contestants ranged from Le Rendezvous (who did a Thai chili margarita), Rigo's (that had a agave nectar one with smoked orange and lime), Trident (which offered a kiwi inspired drink), Tequila Factory out in Casino del Sol (that did this passionflower number and was easily the most stunning looking), Cielos at Lodge on the Desert (who did a Cadillac version) and one of my favorites of the night, the Gourmet Girls made a prickly pear margarita that was a satin purple color and was really tasty. Man, this judging thing is tough. Not too sure who I wanted to win. So lovely I almost don't want to...forget that, let's drink! By 8pm the judging was done. I was really full, not only from the food, but from the amount of sugar I just took in. My usual drink is just decent vodka and soda or seltzer water over ice. Not a huge fan of sugary fruit drinks. But all of the entries were awesome and I was really glad to be a part of the event held by SAACA (Southern Arizona Arts and Culture Alliance) and Tucson Originals. Thank you guys for inviting me! I texted She-Ra to say that I was done. So the 15-20 minutes it would take her to get me, I made my way around the grand ballroom to check out the action one last time before I left. After running into people like chef Ryan Clark, chef Tim Moore of Pastiche, chef Wendy Gauthier of Chef Chic and doing a shot of Limoncello with Rocco, my phone buzzed and my ride had arrived. Once home, I had one drink to calm the sugar buzz, drank some water, washed up and crashed out. Thankfully I woke up the next day feeling just fine. See, you gotta pace yourself. 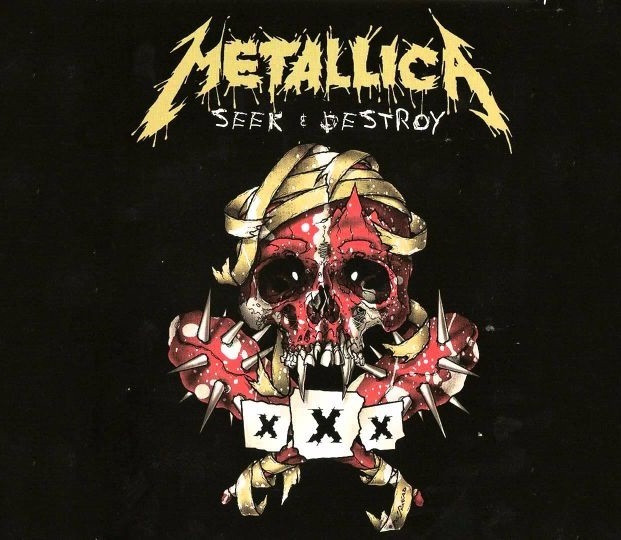 Little advice from your old pal Metal Mark. Can you imagine if I had actually finished all the tequila laced drinks they placed in front of me? I didn't stick around to see who won but Fresco Pizza was the judges pick and I can see why. 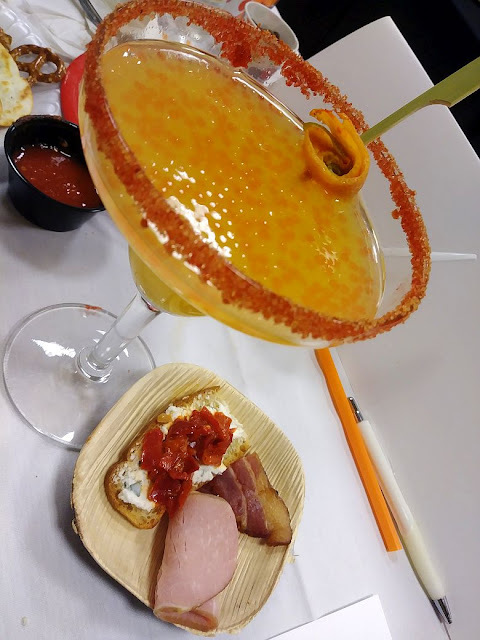 They did this sort of boba tea style margarita with lil' balls of tequila goodness floating in it. So yummy. 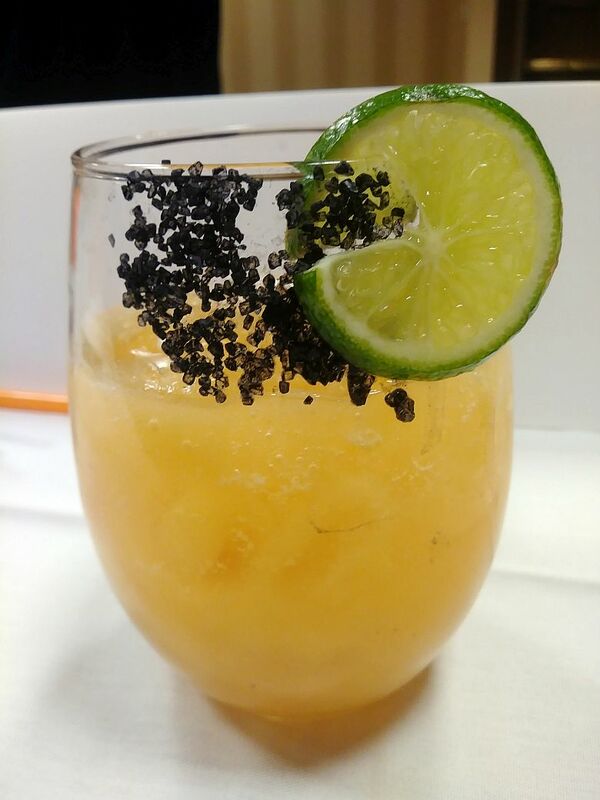 And the people's choice went to Tequila Factory because not only was it delicious but was really nice to look at too. Apparently the announcers were so wasted that they thanked a Mary Whittaker for being one of the judges. Mary. That's good. Kinda wish I stuck around to hear that one. Can't wait to be a part of another food and booze competition. Hopefully this amazing journey will never end because I am having way too much fun. 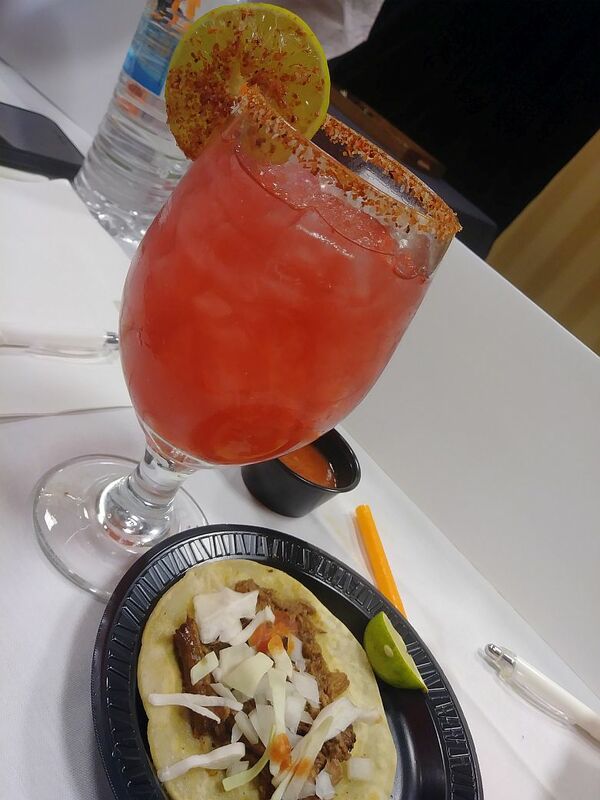 As long as I have this blog and still contribute to the Weekly I'm pretty sure my time as a Tucson culinary judge will continue. I think that is what we call a heaven for foodies haha. Wish I could attend such an event. Going to show this to my friend and I know he will feel the same.